Non-nutritive sweeteners (NNS) include: Aspartame,(Nutrasweet,Equal), Saccharin (Sweet’NLow), Sucralose (Splenda), and Stevia (Truvia, PrueVia). NNS do not add calories, nor do they add nourishment. In theory these sweeteners should support blood glucose control and weight management but there has been some controversy. For example, some studies indicate that persons who drink more than twenty-one diet sodas per week are twice as likely to become overweight or obese as people who do not drink diet sodas. The main issues include compensatory overeating, effects on the way we taste food and unknown effects of years of use. Remember to look at food labels; ‘sugar free’ is not necessarily healthy. Please use NNS in moderation. The available oral medications do not adequately control your blood glucose. You have type 1 diabetes or latent autoimmune (slow onset type 1) diabetes. Intensive control is necessary for you, for example in hospital. Talk to your diabetes physician about insulin today. Insulin is a hormone released by beta cells within the pancreas. Insulin helps with the entry of glucose into cells where it is used for energy. For persons with type 1 diabetes mellitus (DM) there is an absolute insulin deficiency requiring injected insulin. At least 30% of persons with type 2 DM may also require injected insulin. This depends on how much insulin the pancreas produces and the level of insulin resistance. There are generally two categories of insulin: long-acting and short-acting. The latter is used to quickly correct a high blood glucose level and to cover meals, whereas the former acts for 18 to 24hrs to control blood glucose. Yes. The body has been using fat for energy prior to correction by insulin administration, therefore a few pounds are restored when diabetes health is restored. Won’t insulin use cause hypoglycaemia? The symptoms of hypoglycaemia include sweating, palpitations, weakness/dizziness, confusion, syncope and anxiety. These symptoms may occur below 70mg/dl but this may vary between persons with diabetes, depending on the duration of diabetes. Your dose of insulin is adjusted carefully by your diabetes physician to achieve optimal blood glucose levels. Hypoglycaemia can occur if there is a change in your routine, specifically, skipping a meal, or more vigorous activity or exercise than usual. 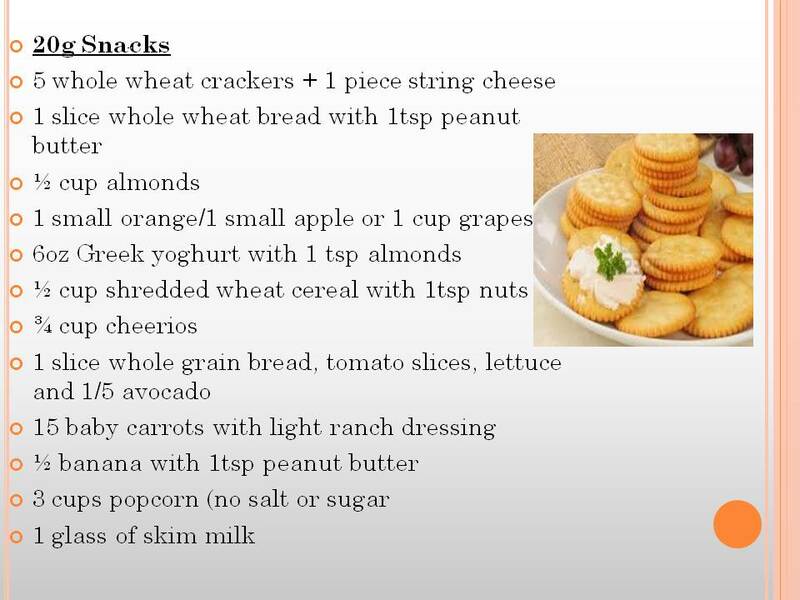 Take a snack before exercise and avoid skipping meals or using excess alcohol. Hypoglycaemia can be defined as low blood glucose. The levels at which low blood glucose causes symptoms may vary from person to person; generally this may be around 70mg/dl. The symptoms may include perspiration, tremor, anxiety, dizziness, behaviour that can be confused with drunkenness, blurred vision, confusion. Less commonly coma and death can occur. One of the most common causes of hypoglycaemia is skipping a meal while on insulin. Medications (tablets) that may cause hypoglycaemia: Glyburide, Glipizide, Glimepiride, Nateglinide. Have glucose tablets or a snack on hand to treat hypoglycaemia if you take insulin or these medications. When you have been diagnosed with pre-diabetes or diabetes you will receive essential advice about your meal plan. The goal is to maintain blood glucose control while maintaining your nutritional needs, sometimes known as medical nutrition therapy. Other goals will include to lower cholesterol and triglyceride levels, adequate blood pressure control and weight loss. The meal plan is individualised, but generally consists of regular meals and snacks with consistent carbohydrates especially if using insulin; reduced portion sizes for weight loss; reduction of saturated and trans fats, processed foods; reduction of sodium (salt) intake, while increasing vegetables and high fibre whole grain cereals and bread, and legumes, if specific food sensitivity is absent. One highly recommended meal plan type is the Mediterranean diet which is a meal plan originating from the countries surrounding the Mediterranean Sea (Greece, southern Italy and Spain). Healthy eating, moderate exercise, self monitoring of BG and a positive outlook will help to decrease your diabetes risk, decrease your need for medications and reduce your risk of complications. 1. Eat breakfast. This is especially important when taking medications for treatment of diabetes. Breakfast ideas: Oatmeal, whole grain cold cereal, whole grain toast with low-fat milk/ yoghurt, peanut butter on toast, smoothie (fresh fruit of choice); French toast with whole grain, egg white with cinnamon. 2. Three meals per day. 3. At least four servings of vegetables, three servings of fruit per day. Steam/lightly cook vegetables. Add fruit to your cereals/yogurt. Non starchy vegetables: Onion, cucumber, broccoli, cauliflower, beets, tomatoes, spinach, carrot, lettuce, cabbage, okra, turnip, peppers, mushrooms. Starchy Foods: Whole grain bread, high fibre cereal, oatmeal, crème of wheat, brown rice, potatoes, pasta, cooked peas & beans, low-fat crackers. Meat/ Protein: chicken/turkey without skin, fish (salmon, tuna) & seafood. Lean cut: beef, pork and low-fat cheese. Add a piece of fruit and 8oz Low fat milk or 6oz yoghurt. Snack on vegetables at anytime and incorporate into every meal. Eat fruits in moderation. 4. Eat whole grains: Whole grains contain more vitamins/minerals than refined foods, increase bulk, increase satiety and keep blood sugar levels more stable. 20-35g of fibre recommended daily. 5. Healthy Fats: Olive oil, vegetable oil (canola), Avocado, nuts, nut butters, sunflower seed. Fats are high in calories; consume healthy fats consumed sparingly for adequate weight management. Trim fat from meats. Avoid saturated fat and trans-fat: these are found in meats, whole fat dairy (butter and cheese), margarine, lard, cocoa, butter, egg yolk, coconut and vegetable shortening (often found in baked goods). Choose fat-free dressings, oil vinegar dressings. 6. Combine your healthy meal plan with 30 minutes of exercise every day. 10 minutes x 3 of brisk walking can produce the same benefits as a 30 minute session. Take the stairs, walk to your car, watch TV or read while on a treadmill or exercise bicycle. Get started, start slowly and persist. 7. Avoid foods with corn syrup, dextrose, sucrose, glucose, fructose, high fructose corn syrup or molasses as first few ingredients. Avoid alcohol if your blood sugar is not under control. Avoid Low calorie artificial sweeteners. Finally, also avoid eating at restaurants. Up to date research has shown that two large meals per day – breakfast and lunch – can help with weight loss and blood glucose control. This meal plan was compared to six smaller meals per day with similar caloric content (calories). The study included persons with type two diabetes of varying weights and blood glucose control. There were only 54 participants in the study and none of them used insulin therapy. This study reinforces previous advice of having a large breakfast everyday and light meals in the evening. However advice may vary if you have certain stomach disorders or complications of diabetes so please ask your diabetes physician before changing your meal plan.